The Excedrin Migraine website claims that "Excedrin® Migraine is FDA-approved to treat migraines symptoms, including pain, nausea, photophobia and phonophobia" But what is this painkiller really, and will it help the average migraineur? Let's take a look. This medication was actually a bit of a breakthrough, being the "the first over-the-counter medicine approved for treating pain associated with mild to moderate migraine headaches." (FDA Talk Paper) That was back in 1998. 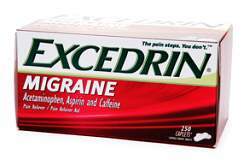 The basic ingredients in Excedrin Migraine are acetaminophen (paracetamol), aspirin, and caffeine. Today, pain killers with these ingredients, or two or one of them, are actually quite common. Acetaminophen (Tylenol or paracetamol) is well known in many medications. Aspirin is also of course common, and it cuts down on pain and inflammation. Caffeine enhances the qualities of the other two, and may have some headache-fighting qualities of its own. Though these are considered to be generally safe ingredients, it's important to keep in mind how much you're taking. For example, you might take a cold medication and EM, and find that you have overdosed on the acetaminophen (paracetamol). For more on Tylenol read here. Most of us have heard of caffeine, though you may not know it's a popular headache medicine. Again, you need to be careful about taking too much caffeine. Though it can help with the pain-killing, it can also increase the possibility of rebound headache (medication-overuse headache). And that can turn a bad migraine dream into a nightmare. It may seem obvious - Excedrin Migraine is for migraine, right? Well, yes and no. When the FDA approved the new drug in 1998, it clarified: Although migraine headaches can include significant symptoms other than pain, this product is indicated only for treating pain associated with migraines. Migraine involves a whole lot more than migraine headaches. In fact, it's possible to have migraine with no headache at all. Although in the beginning EM was marketed only at migraine headache, it's now being promoted as treatment for migraine symptoms, including the nausea and sensitivity to light and sound that are so common during a migraine attack. More thoughts on specific migraine headache medication here. Apart from the cautions above, there are other warnings to notice. First, it's important not to drink alcohol while taking this medication (due to problems with liver damage). Also, you should be careful if you've had allergic reactions to any painkillers (even those other than the ones above). Remember, if you have a recurring headache, or a new headache, or one different than any you've had before, you need to see a doctor right away. In order to avoid medication-overuse headache, it is very important that you are using EM fewer than ten days in a month, and only according to the instructions on the label. If you feel you need more, it's time to get back to your doctor to look for better options. For more general cautions about this medication, see the packaging on the Excedrin Migraine website, or this extended information at drugs.com. To find various types of Excedrin Migraine online, do a search on our search page in the drugstore.com box. One more useful tip: Drink a full glass of water after taking your medication. It helps to make sure the medicine gets where it's needed ASAP - especially important when it comes to migraine. Read about another Excedrin product - Excedrin Tension Headache.